Wootz! People’s Choice Award is back! Now you can start voting for your favourite brands and stand a chance to win up to RM30,000 worth of prizes. Awesome right! this is the 13th consecutive years Guardian Malaysia organize such brand voting so that the consumer can have a say of what brand they preferred the most. The Grand Prize of a RM10,000 Guardian vouchers and a 3D2N holiday spa for 2 at Mandarin Oriental Hotel Kuala Lumpur; two 1st Prize Guardian vouchers worth RM5,000 each; three 3rd Prize Guardian vouchers worth RM500 and 50 Consolation Prizes of Guardian vouchers worth RM50 each. All you have to do to enter this contest is spend a minimum of RM20 during the contest (period) starting 3rd to 29th April 2014. 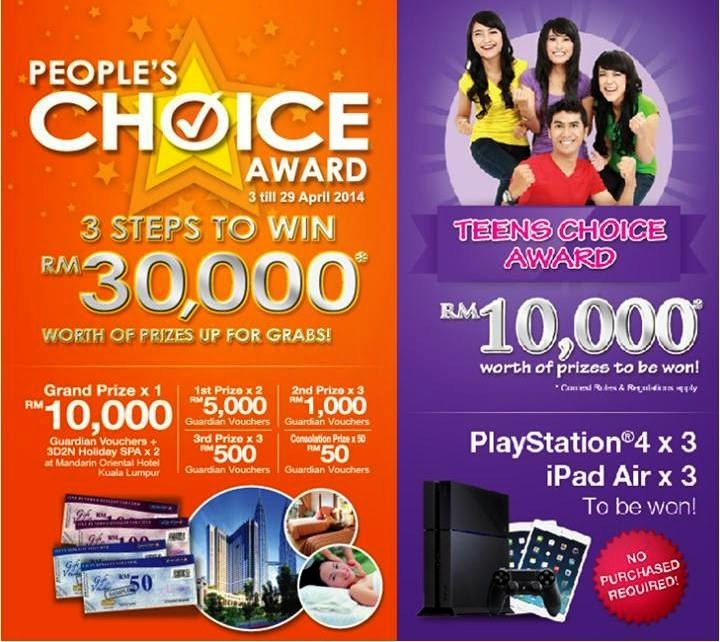 All entries can be submitted via contest forms or visit www.facebook.com/guardianmalaysia to register and vote foryour favourite brand online. Please take note, keep your receipt for winners’ verification and redemption. There are 90 participating categories and close to 400 products this year for the People’s Choice Award and the Teen Choice Award ranging from hair care, face care, personal care, cosmetics, beauty, hygiene, supplements & medication, mother and child products, confectionery, home & accessories.